Announcing Lead Assist: AI Lead follow up and nurturing! 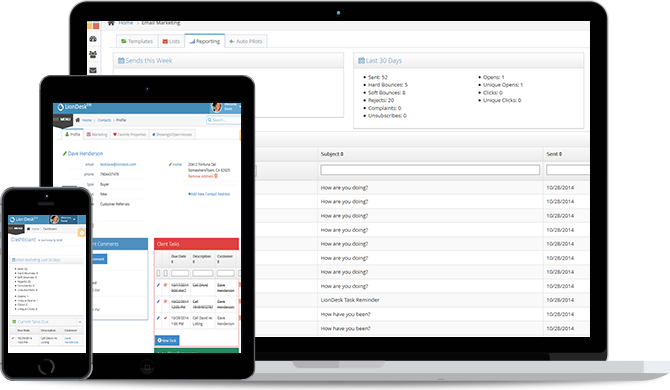 Client Management has never been easier. Track your phone calls, emails and other interactions. Powerful filters allows you to see who you should be contacting next. I Love it! What used to be two or three different systems I was paying for, I can now do all of it just with LionDesk. 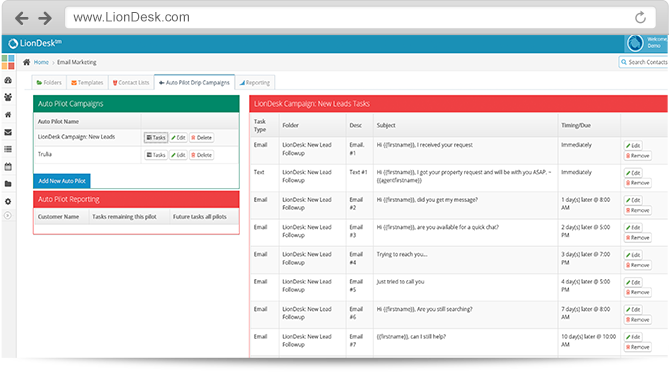 Automate your follow up process with LionDesk's drip marketing campaigns with your custom templates. 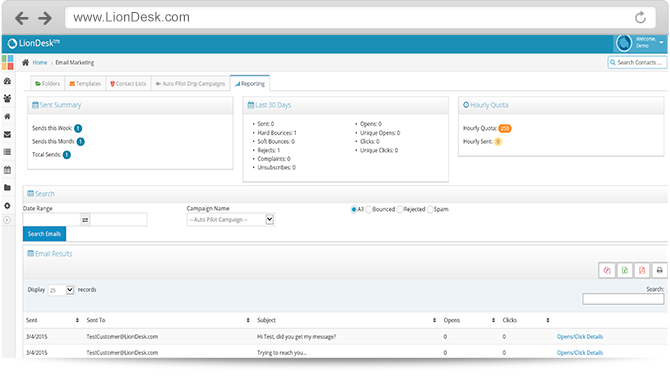 View reporting on which of your campaigns are working best, view open rates, click throughs and more. Never miss another task again with the LionDesk Property Plan tools. Use a pre-built plan such as our Closing Plans, Listing Presentations, 30/45 day escrow plans, or create your own task lists to help you manage every detail associated with a listing, sale, open house and more. Never miss another deadline again. 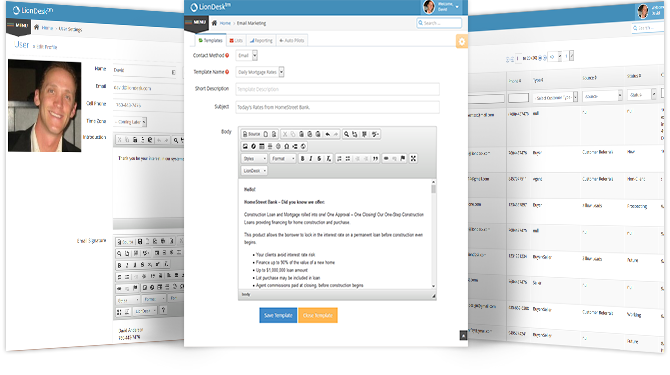 Upload your legal documents, client presentations and more to LionDesk by either uploading or emailing it. It's easy to email my client presentations directly to LionDesk so that when I meet with my clients, I don't have to hunt for anything on my Ipad. 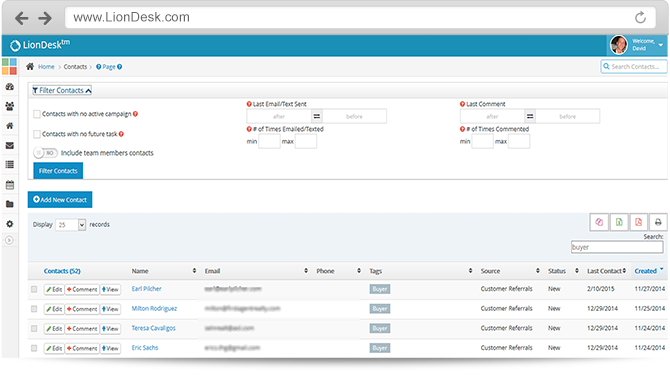 With LionDesk, you can assign leads and contacts to other team members and distribute to them based on performance. Create Teams and Share Contacts and More. 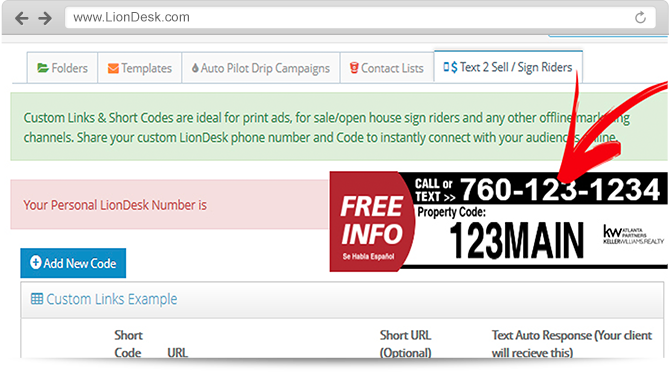 Whether your leads come from Zillow, Trulia, Realtor.com, IDX websites, or your friends and family, LionDesk can handle them all. All my leads come into one place and all of them get contacted instantly...conversions have skyrocketed since using LionDesk. Send emails to your prospective clients and know exactly when they open or click any links on your message. By taking a glance at who's opening up your emails, you can follow-up appropriately and close more sales. Track opens & clicks...Respond immediately to close more sales! 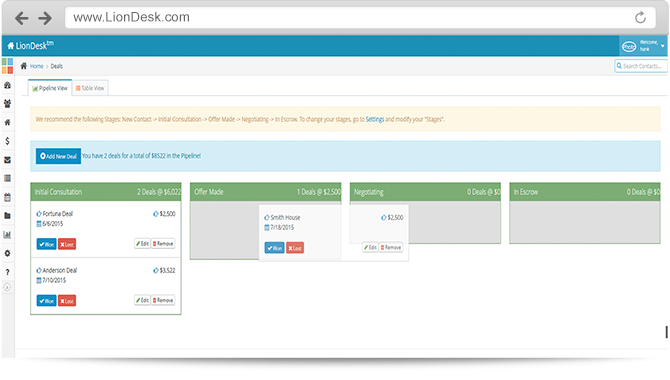 View an easy picture of your deals you have in the pipeline with fully customizeable Stages for your specific needs. Easily Drag & Drop Deals from one stage to the next! Get an immediate response to close more sales! What are agents saying about LionDesk? I love, love, love, the dashboard. It's so easy to watch the agents...that alone was worth the move from Top Producer. 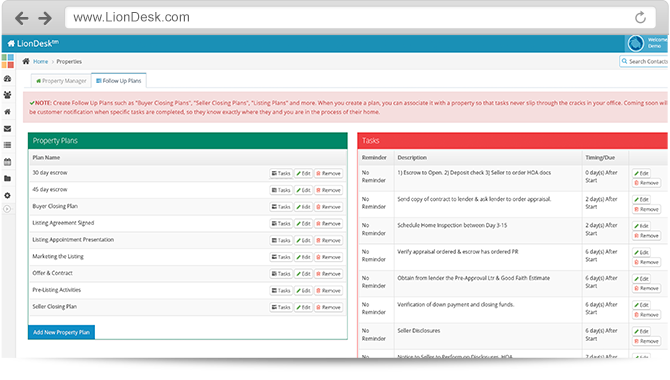 Before signing up with LionDesk, I was using three different systems to manage my Clients, Leads and Properties. Now I just use LionDesk! 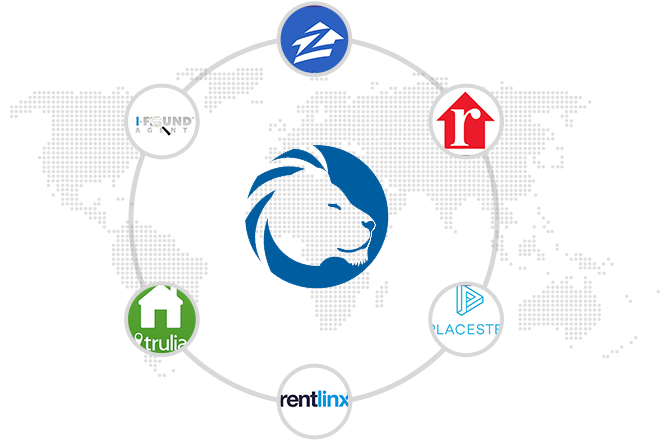 We use LionDesk to manage every lead we get from Zillow, Trulia and other lead sources. Having instant responses and text notifications to myself and my clients allows me to close more leads, more quickly. LionDesk just makes it so easy to follow up on not only my clients, but also allows me to make sure my entire team is working their clients daily. It's FREE and there is NO credit card required. You'll automatically be given access to the PRO version of LionDesk, the Real Estate Agents newest and most powerful CRM+ tool available on the market. Send out emails, texts, outbound calls, track conversions, import leads automatically from Zillow, Trulia and Realtor.com...sell! Ready to begin using LionDesk with your Business?